Rolls-Royce, one of the world’s leading pre-eminent engineering companies focused on world-class power and propulsion systems, has chosen our innovative noise control technologies to reduce noise at one of it’s leading UK facilities. As part of the project, we completed the installation of a large bespoke acoustic screen. 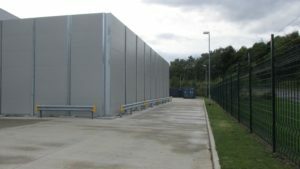 In line with client requirements the 6m high x 20m long screen was manufactured with plastisol panels and hot dipped galvanised framework and was designed to reduce noise from the large chiller units in line with local planning conditions. We also completed the installation of an acoustic enclosure, to reduce noise generated by two large scrubber fans by a minimum of 15dB(A). In compliance with local planning conditions, the enclosure was designed to incorporate a ventilation system for motor cooling, access doors and was developed to integrate into the existing site steelwork structure.